The Ibizan Hound, belongs to the family of primitive sighthounds found throughout the Mediterranean. 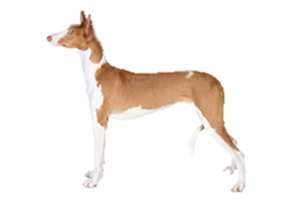 This includes the Cirneco dell’Etna, Pharaoh Hound, Podenco Canario, and the Portuguese Podengo Grande. The term ‘sighthound’ is a bit misleading as the Ibizan Hound uses sight, scent, and hearing while hunting. It excels at all small game although its specialty is rabbit and hare. They are also capable of working as gundogs (including being used for retrieving). Traditionally they are taken out in small packs or as a pair without the use of firearms. The Ibizan Hound has a unique way of finding lost prey by standing on its hind legs to look over the terrain and bush to relocate its quarry. So adept is this breed on the hunt that it was once a favorite of poachers, causing it to be banned on the French mainland. Traditionally few pups were kept from litters. With islanders barely able to feed themselves it was impossible to care for multiple dogs. The weaker pups (males in particular) were often drowned, leaving only the strongest to survive. Although cruel, it was this practice that led to the efficiency of today’s Ibizan Hound on the hunt. The Ibizan Hound is recognized as a Spanish breed. However, it was found throughout the Balearic Islands, on the southern part of the Spanish mainland, in areas of France, and on the island of Crete. Ibiza itself has been the stronghold of the breed for centuries although it is unknown how (or when) their ancestors arrived on the island. The most commonly held theory is that they were brought to the Balearics by the Phoenician traders via Egypt. If correct, all Mediterranean sighthounds likely descend from the ancient Tesem. However, this is a simplified version, as the Greeks were also adept at marine travel and could have easily brought dogs to the island. In addition, the tie to Crete is interesting as it is the homeland of the Kritikos Ichnilatis, or Cretan Hound. While this breed is not a sighthound, it is a primitive, ancient dog. It is possible they shared an ancestor long ago. If so, the Ibizan Hound would probably have a close tie with the Cirneco dell’Etna who may also share ancestry with the Kritikos Ichnilatis. Is the Ibizan Hound Right for You?